Change isn't always easy, no matter the kind of progress it promises. And as cloud-based solutions have brought about a bit of a renaissance in how companies manage their operations, the need for businesses to make a case to their staff for the rollout of a new technology has become almost as important as the technology itself. The basic idea is simple; people want stability. And depending on where a staff member is in an organization, they're going to have different perspectives on, and different fears about, how a new solution might impact their stability when it goes live. Undoubtedly one of the biggest ones is that people want to be certain that the tools being touted as making their jobs easier won't actually make their days more difficult. And that's definitely one of the biggest change management concerns you'll face from your legal team. Lawyers are highly-skilled and have a reputation for being highly-stressed, rigorously thorough and demanding of themselves and others. In some ways, it's part of their job to be that way. It's that drive and a meticulous understanding of the lingo of litigation and contract negotiation that makes them a critical part of any enterprise. And if you lead a legal department, you know these traits can also mean they're set in their ways. Of course, it depends on the individual, but dropping a stack of printouts on your legal team's desk and demanding they get in line with the new way of doing things may get you blowback and cantankerousness instead of compliance. And approaching a big change with a blasé attitude is the wrong way to do it. But there is a right way; that's where change management comes in. Change management can be tough across the board. But at SpringCM, we're no strangers to managing change. Here's a quick look at what hurdles you can expect, and what steps you can take to make a big change no strain at all to legal staff or any of your other loyal employees. Precision and exactness are hallmarks of the legal profession. Every word in a document is there for a reason. And so if there's one thing your legal team will push back on, it is technology that looks like you're deploying it just for the sake of having the shiny new toy everyone's talking about. Luckily, if you're implementing a proven, functional tool, you've got plenty of justification and plenty of proof that there's real value to be found at the end of the implementation. One of the most important parts of change management, in this case, is getting that story across to an audience wired for skepticism. What challenges are you overcoming with this solution? How will it help you do business better, given the specifics of your industry? What is the tool bringing to the table that you don't already have on hand? From the answers to these questions, craft a story about the solution’s value -- one that you can tell confidently and frequently. While your legal team might require more legwork to get on board, they won't be the only department that will need some easing into the new normal. Just as with legal, you should identify each of your stakeholders and have a story mapped out. Why do they, in particular, need this new solution? How will it make their lives easier? The story will be a different one for your account executives than it is for your operations managers and so on. But each of these distinct stories should be rooted in an understanding of each department's needs, and what the solution will do to meet them. Within any department, you'll probably have a range of relative early-adopters and relative skeptics when it comes to new technology. It's important as you're managing change not to overlook those who are naturally in your corner. In your communications and in your trainings, leverage those people who want to help you. They and the others working on their team have a shared experience – they know the demands they face every day. So if a few people on the team are thrilled with what the solution promises, they're the best ones to spread the love. Developing a good story for every department and a solid feel for who will support you gives you a strong foundation for a successful project. But you also need an organized approach to get the word out. Ask yourself: how will you be messaging people in each department at each point in the implementation? When and how will you conduct trainings? How will you make sure your trainings really address the needs and concerns of each team? And don't forget to determine how you will be measuring the success of the implementation. Measurement is key to making good on the promise you’ve made to your staff. You've spent months telling the story to each department – now let the metrics and the survey responses write the happy ending and demonstrate how your new solution is meeting the goals you set. Or if there are still people who feel like they're not getting what they expected out of the solution after you go live, use their feedback to understand what's not working. Change management doesn't end with the launch of a solution. Whether it's a tweak to the technology or a different personal approach you need to take, appreciating and acting on feedback is a critical part of maintaining the credibility you've built with each team throughout the project. Now that you've gotten a feel for the challenges you might face when introducing change – and some strategies that will help you overcome them with your legal team and the other critical teams throughout your business, you're ready to take the next step. SpringCM invites you to watch our on demand webinar, 7 Steps to Successfully Introduce Change at Your Company: Tips and Tricks for Legal Leaders. 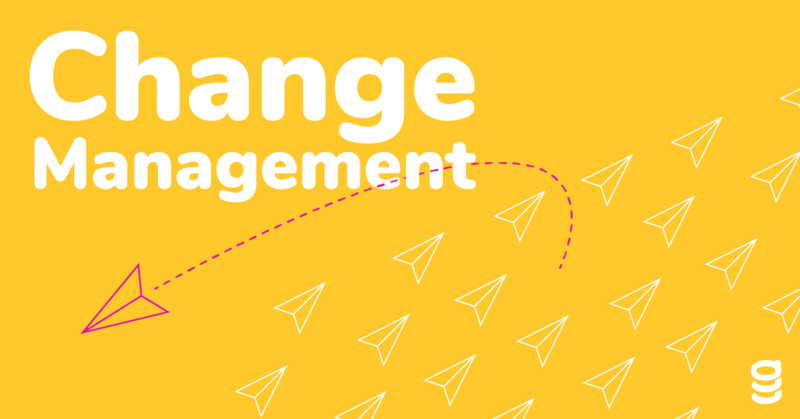 SpringCM’s Director of Legal Technology and Rise Interactive’s VP General Counsel share their experience in crafting a change management plan to set you up for success. Streamlining operations—especially legal operations— is as much about people as it is about technology. If you approach change management the right way you can assure that the people you trust to make your operation a success are as enthusiastic about your big tech upgrade as you are. And we're excited to show you how to make it happen!